The portfolio of self priming pumps offered by Matrix range from the most commonly considered liquid ring style through to the new sanitary self priming LKH pump. The traditional liquid ring pump provides excellent suction characteristics and can easily evacuate vessels of cleaning fluids containing air and liquid. Perfect for CIP return duties. The Self priming LKH Prime now takes that concept and adapts it to the highly efficient and quiet LKH range of centrifugal pumps. Alfa Laval LKH Prime is an efficient, versatile and hygienic self-priming pump that uses a combination of air-screw technology and advanced design to meet the most stringent requirements in a range of hygienic industries including food, dairy, beverage, home and personal care. Primarily used for Cleaning-in-Place duties containing entrained air, it can also pump product, reducing capital investment. 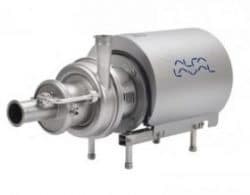 Alfa Laval LKH Prime UltraPure is an efficient, versatile and hygienic self-priming pump that uses a combination of air-screw technology and advanced design to meet the most stringent requirements in the pharmaceutical industry. Primarily used for Cleaning-in-Place duties containing entrained air, it can also pump product, reducing capital investment. The MR range of pumps is specifically designed for pumping liquids that contain air or gas.These pumps are most commonly used for CIP return applications. This self-priming pump is designed for use as a CIP return pump or for tank drainage, since it is capable of transporting products with entrained gas.